In this lesson, we will learn how to use line graphs to analyze data, communicate information, and get insights from data. The line graph shows how much a person saved in each of the first four months of a year. 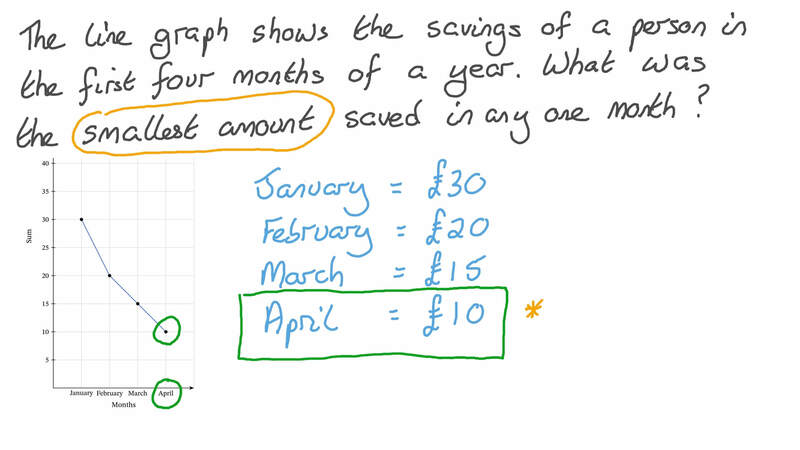 In which month was the smallest amount of money saved? The line graph shows the ages of 125 people. 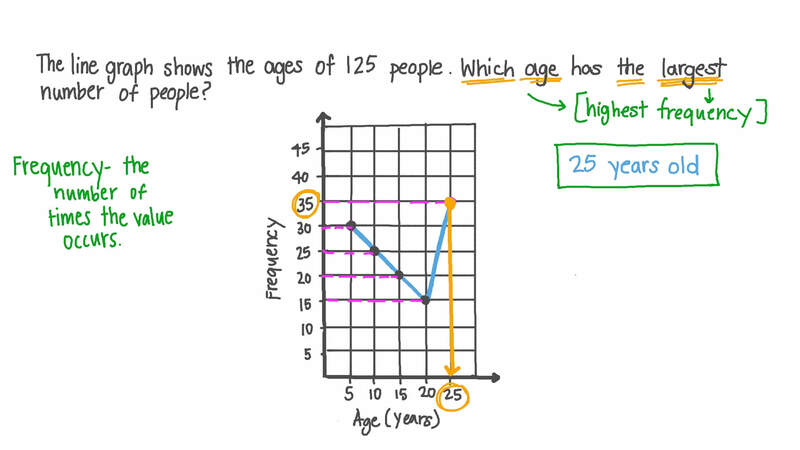 Which age has the largest number of people? The line graph represents the balance in Yara’s savings account over 5 months. Between which two months did the balance decline? The graph shows the average numbers of different fish that are found in the Red Sea. 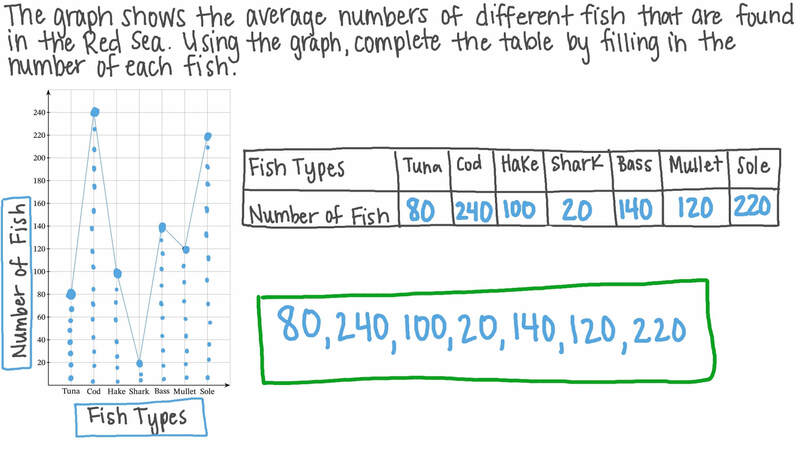 Using the graph, complete the table by filling in the number of each fish. The graph shows Dalia’s total savings over seven weeks. Did her total savings decrease from week 3 to week 7? The graph represents Samar’s total saving over seven weeks. Is it true or false that, by the end of week 7, Samar’s total savings were $175? The line graph shows the area of farm land in a country from the year 2001 to 2005. Did the area of farm land decrease from 2001 to 2005? The graph shows Mona’s total savings over seven weeks. Did she save more money from week 5 to week 6 than any other week? This line graph shows the number of machine units a factory produced over 5 months. In which month did the factory produce the most machine units? The line graph shows the sales figures for a company in the first half of a given year. In which month had the sales increased the most from the previous month? By how much did they increase? The line graph shows the area of farm land in a country from the year 2001 to 2005. Did the area increase or decrease from 2001 to 2002? The graph shows the number of units produced in a factory. Over 5 months of a year. Determine the difference in the number of units produced in February and May. The graph shows the savings of Dina in a 5 months period. Find the difference between her highest and lowest savings. The graph shows the average numbers of different fish that are found in the Red Sea. Find the sum of the highest and lowest number of fish. The line graph shows the area of farm land in a country from the year 2001 to 2005. Was the area of farm land lowest in 2001?